For millions of NFL fans, opening weekend competes with Christmas morning, while for hundreds of players it means sleepless nights awaiting cut day. In the NFL, cut day is the day each organization must dwindle its roster down from 90 to 75 and eventually from 75 to 53. From current Hall of Famers such as quarterback Johnny Unitas to future Hall of Famers such as quarterback Peyton Manning, nearly every NFL athlete to date has been told, “Your services are no longer needed.” The saying goes, “You haven’t played long enough if you’ve never been cut.” I guess that means I played far too long because I’ve encountered what we in the football world call the “grim reaper” one too many times. In the locker room, the grim reaper is real, and he’s coming with his scythe in hand for your NFL career, or at least career with that team. The grim reaper comes in unsuspected forms, oftentimes a scouting intern who takes the shape of every athlete’s biggest foe and deepest fear. And like death, you never know how and when the reaper might strike. 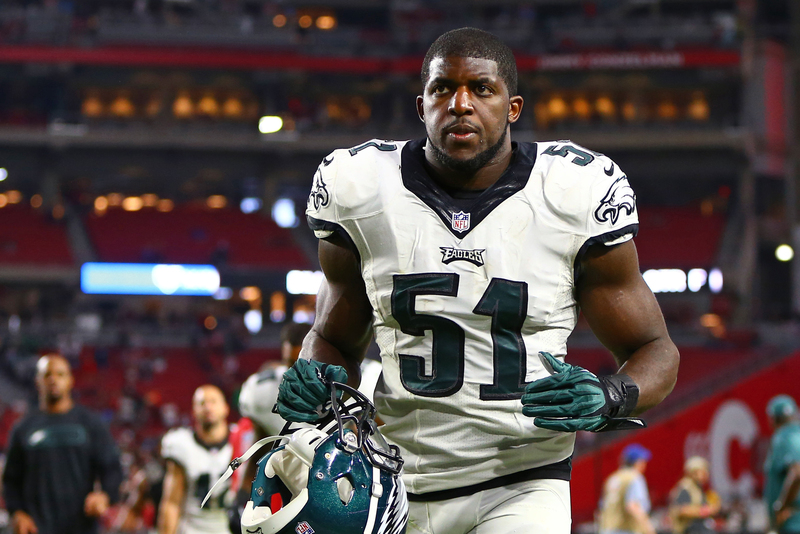 Philadelphia Eagles linebacker Emmanuel Acho (No. 51) against the Arizona Cardinals at University of Phoenix Stadium. Let me take you back to Aug. 30, 2013 — all 32 teams had just concluded their final preseason game and it was the night before the front office of each organization would trim its roster from 75 players to the official 53-man roster. At the time, I was a member of the Philadelphia Eagles. That Friday, our owner was kind enough to throw a team barbecue for the players, coaches, staff and all of their families. It all seemed pretty harmless. I finished packing my bags in preparation to head to the airport and watch my alma mater’s home opener directly after the barbecue. I was all but sure I was going to make the roster. I pulled up to 1 Novacare Way, the Eagles’ practice facility, and as the gate attendant let me in, I got a call from a teammate. “Bro, I just got cut,” he said. “What do you mean you just got cut, aren’t you at the barbecue?” I asked. He replied, “Yeah, but the grim reaper is inside.” My stomach dropped as I realized this wasn’t your normal barbecue. I entered the building as the Mission Impossible theme song played in my head. My goal was to get to the practice fields, where the barbecue was taking place, without getting the notorious tap on the shoulder followed by, “Please return your playbook.” Moments later, my mission was complete. I made it to the fields unscathed, barbecued ribs in hand and a smile from ear to ear. I departed for Austin, Texas, later that night and proceeded to Darrell K. Royal-Texas Memorial Stadium to watch the University of Texas take on New Mexico State University. I sat there for hours feeling sick, waiting to get the call from that 215 Philadelphia area code. Every time I checked my phone or refreshed my Twitter, I was notified of another player being cut. I hurt for these brothers in my elite fraternity, but quickly realized every other player’s release brought me closer to realizing my dream. Promptly at 3 p.m., all those watching the game erupted with applause and high-fives to go around. Everyone else was praising another Texas touchdown, but I was celebrating the passing of the 4 p.m. EST cutoff for the team’s final roster without me receiving a phone call. Two days went by, it was now Monday and I had finally returned all the congratulatory texts I had received for making the team. It was officially game week – well, almost. All I had to do was survive 24 more hours. In the NFL, Tuesday is the magic day. Tuesday signifies you have put Sunday or Monday night’s game behind you and you’re moving on to the next opponent. Most importantly, Tuesday signifies payday! As long as you’re on the roster by Tuesday at 4 p.m. EST, you get paid for that week. I pulled up to the facility, and for the first time met the grim reaper face to face. He was someone in the scouting department I had never seen before. He didn’t say much. I handed him my playbook, he handed me a trash bag. I cleaned out my locker and that was it. The following Sunday I watched No. 53 run around Lincoln Financial Field, but this time my name wasn’t on the back of the jersey. The Eagles signed me back two months later, and I finished the season with the team, but not before one more encounter with the grim reaper in week 15 when I was subsequently placed on the practice squad. Five months had gone by since the 2013 season had ended. It was late May and I had just concluded an offseason workout. I walked up the steps of the Eagles facility en route to see the special teams coach. I only partially wanted to get some extra film study in with coach, but I’d also learned the tricks of the NFL. If you want to make the roster as a backup linebacker, the special teams coach had better become your best friend. I’m sitting in the chair next to coach with the projector screen in front of us reviewing the practice tape from earlier that day. Glancing to the right, I noticed what appeared to be an updated depth chart with every player currently on the roster. My eyes finally found the label that read, “Linebackers,” so I began to work down the list of names until I found my own. I never did. I took my eyes back to the top and worked my name down the list once more, but again nothing. I hadn’t changed positions and to my knowledge was still on the roster, so I began checking the names under every single position group in search for my own. The special teams coach was still talking me through corrections from that day’s practice. I was no longer interested, but still sat there trying to play it cool. I finally found my name — it was under a small label at the bottom of the board that read “CUT.” Once again, I was devastated. Not because I had been cut, but I could only imagine what was to come. There were two other players’ names under that label: One had been released the previous week, the other, a friend of mine, let go the previous day. I dismissed myself from the meeting and didn’t bother to offer an explanation. I needed a minute, I needed immediate solitude to gather my thoughts and pray. As I mentioned, we just finished practice, so every meeting room was taken up by players getting in extra film study. After pacing back and forth down the upstairs hallway, I realized there was one place I could go to be alone. I made a beeline to the restroom, went into the far stall, locked the door and got down on one knee to pray. Not the most sanitary thing I’ve ever done, but the thought of being cut by the same team for the third time in nine months will drive a young man crazy. I was midprayer when it dawned on me that I wasn’t alone. I cracked an eye open to see pants scrunched up above someone’s feet in the stall next to me and realized I’d better get out of there. I didn’t get cut that day. 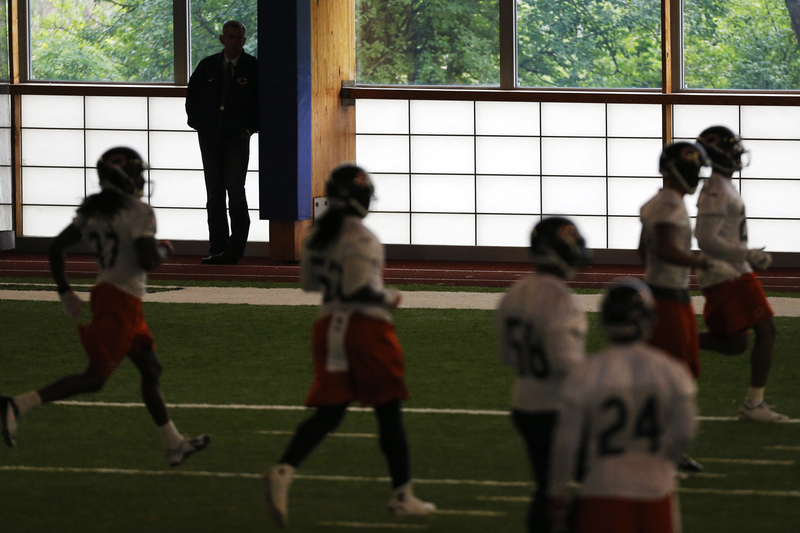 Chicago Bears general manager Phil Emery stands in the background as he watches the team during minicamp on June 19, 2014, in Lake Forest, Illinois. Three months went by and I was headed into the final preseason game of my third NFL season. My NFL career thus far had been up and down and I could sense some doubt from my parents as to whether I could hang in the NFL, which was justified. My brother Sam, who is one year older, played for the Arizona Cardinals at the time, setting a rookie sack record his first year and starting every game his second season. That was the expectation in the Acho household. I insisted my parents come to my final preseason game against the New York Jets. I wanted them to witness my ability firsthand so that they too would understand making an NFL roster is not solely talent-based. The game was a blowout that we won handily. I played well, finishing second on the team in tackles with a near interception. The next day, the grim reaper was back. The calendar had gone full circle and cut day was again among us. I was less nervous this year because I was with my parents, and like all parents, mine were sure their baby would get the job. We walked around the corner to grab brunch and were headed back to house when my life again came to an abrupt halt. The grim reaper was calling. Though, for some reason, this time was different. I picked up with an unforeseen grin on my face as if to say, “What took you so long?” My parents were distraught, I could see it on their faces, but I was simply relieved.